Former South Bend Silver Hawks outfielder Ender Inciarte reportedly has signed a five-year, $30.5 million contract extension with the Atlanta Braves, who lock him up through four years of arbitration eligibility and what would have been Inciarte’s first year of free agency. Inciarte won his first Gold Glove Award in 2016, his first season with the Braves. He batted .291 with 3 HR, 29 RBI and 16 SB in 131 games. Atlanta acquired him from the Arizona Diamondbacks in the Shelby Miller trade last December. 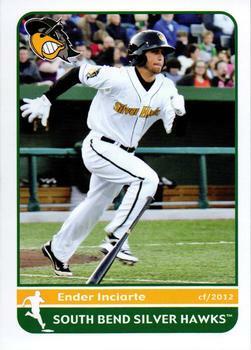 Inciarte played in 247 games for the 2010-12 Silver Hawks (66 in 2010, 116 in 2011, and 65 in 2012). He cumulatively batted .261 with 3 HR, 75 RBI and 49 SB in the Midwest League. This entry was posted in Gold Glove Awards, Midwest League, South Bend Silver Hawks. Bookmark the permalink.